Vacation In Minnesota, Sorry We’re Closed! 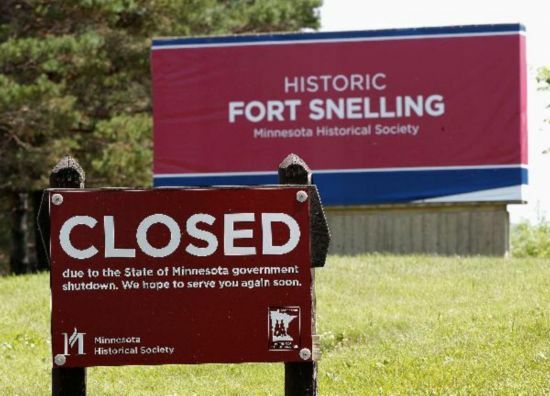 A bicyclist rides on the road leading out of the closed Fort Snelling historic site Friday, July 1, 2011 in Minneapolis after negotiations over the state budget between Republican lawmakers and Democratic Gov. Mark Dayton broke down and the government shutdown at midnight. Even though the Minnesota government has shut down, halting all non-essential services, residents still need to get their state taxes paid. However, no one is at work to process the return. Campers planning to spend the July 4 weekend under the stars have been turned away from state parks. Highway rest stops are closed. Road construction projects are left as obstacles that need to be dodged as you drive through the Land of 10,000 Lakes. State employees are furloughed and uncertain about the future of their paychecks. In short, Minnesotans have all the tax burden and few of the services or security offered by the state. This as Republicans and Democrats in the capital, St. Paul, failed to meet a deadline Thursday night to agree on a budget that addresses the state’s $5 billion deficit. Therefore, the government shutdown went into effect. The two parties are about $1.5 billion apart on paper but worlds apart ideologically. Republicans won control of the state Legislature pledging no new taxes. Democratic Gov. Mark Dayton came to power on the promise that he would preserve state services and put the burden on the wealthiest Minnesotans. As details of their failed negotiations went public, we learned that Dayton had bargained down to raising taxes only on Minnesotans who earn at least $1 million a year. Republicans refused. “Instead of taxing their friends, they would prefer damaging cuts to health care, K-12 education, state and local public safety, mass traffic and other essential services to the people of Minnesota,” Dayton said. Minnesota Democrats want to blame Tim Pawlenty, the former governor and current Republican presidential hopeful. They say the structural budget deficit is the result of his reckless spending policies over the previous eight years. “If this state government would simply live within the revenues it has available, it wouldn’t have any deficits at all,” he said.